This morning I discovered that the primary hard drive on the server running both Cooking for Engineers and Orthogonal Thought (this blog) crashed… so that put me into a pretty foul mood. After a morning touring the NBC studios and learning about John D. Rockefeller, Jr., we headed over to Central Park West intending to visit the American Museum of Natural History. Signe's cousin had provided us with a few options suggestions for lunch in that area and we chose Good Enough To Eat to have brunch because of its high Yelp ratings and its listing in the Michelin Red Book. 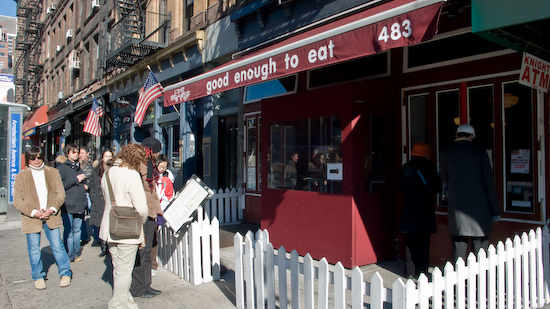 Good Enough To Eat was not a good choice for a party of five to have a quick brunch at - there's basically only one table big enough to sit five (and they just wouldn't leave), so we waited outside for about 45 minutes. If you're a smaller group, the line moves fairly rapidly. While we waited, the line behind us disappeared completely twice. 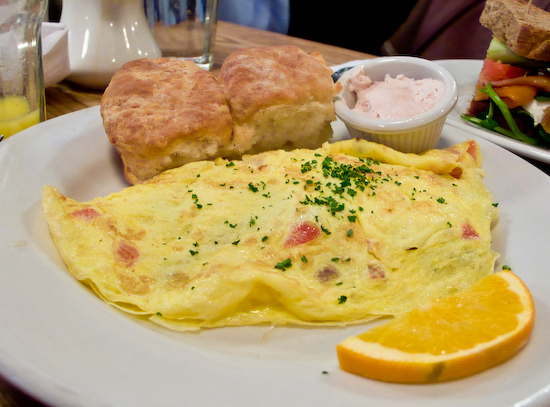 I ordered the BLT Omelet which was fairly good, but nothing exceptional. The butter was whipped and flavored with sweet strawberries and extremely tasty. Unfortunately, even I have limits to how much butter I can consume in one meal - wish I could have taken some with me. We walked over to the Museum afterward and was only able to stay for about 45 minutes due to our reservation at Peter Luger Steakhouse in Brooklyn. We said our good byes to Trevor and Signe and headed back to our hotel. 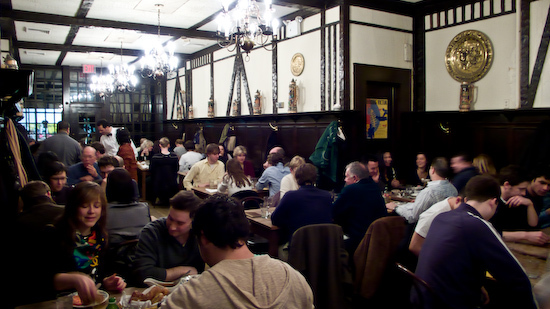 Peter Luger's Steakhouse is probably the most famous (and highest rated steakhouse) in the United States. For over 120 years they've been serving up steak. 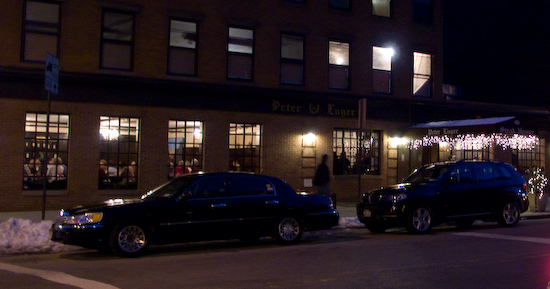 There's a few other items on the menu, but the only thing to order is the Porterhouse Steak which was $84 for two. 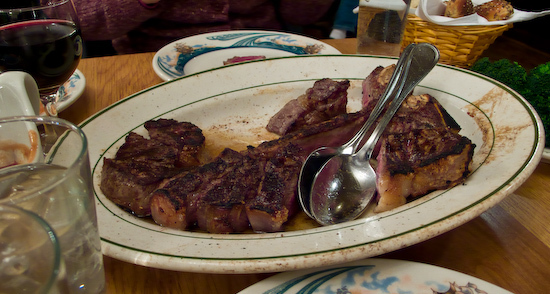 Nothing at Peter Luger's was "pretty", but the steak was the best we've ever had in a restaurant. Tina described the texture of the beef like "eating sushi". 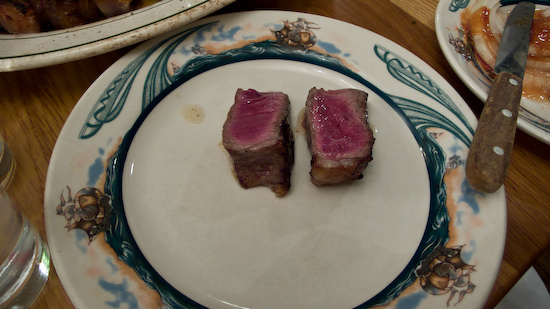 The meat was as smooth as butter and the flavor was not as pronounced as some other steaks we've had before. Adding a little salt helped bring out the subtle beef flavors. 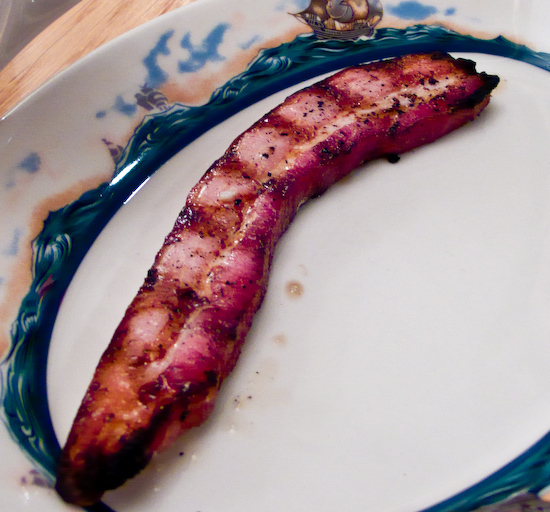 In addition to the steak, we tried a slice of sizzling bacon. This was a thick cut (almost a cm) strip of back bacon, smoked and broiled. It was meaty, fatty, and flavorful. It tasted good, but it wasn't earth shattering for me. The smoked flavor wasn't overwhelming and is well balanced with the saltiness of the pork. Would I make a special effort to order it again? Probably not unless I was in the mood for some bacon. 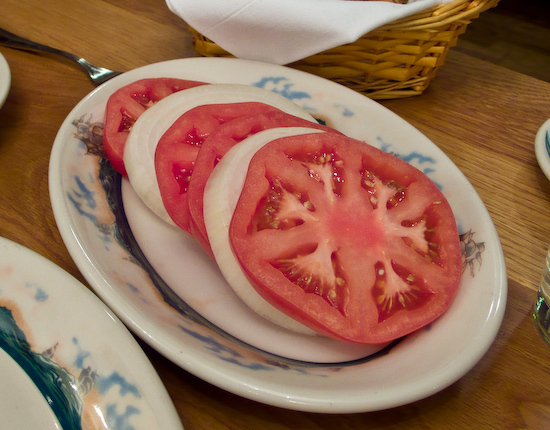 We also had the tomatoes and onion. The tomato slices were huge and thickly sliced. Each bite was meaty but tender. Usually tomatoes of this size taste water logged and have a mealy texture. These were juicy and had great flavor. The onions were sweet, but, after a couple bites, the spiciness caught up to us and we just couldn't down anymore. If we come back, we'll just ordered the tomatoes. 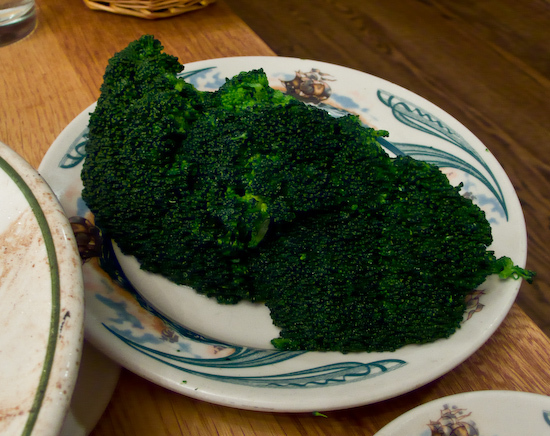 We rounded out the meal with an order of fresh broccoli which came as a few large spears steamed until just soft. It was a pretty good match to the equally tender beef.